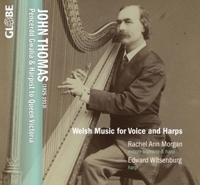 With Harp and Voice - music for Voice and Harp and for Two Harps by John Thomas (Pencerdd Gwalia) (1826-1913). Born in Bridgend, Glamorgan, on St David's Day, March 1st 1826, John Thomas was the eldest of the seven children of Catherine (1806-1863) and John Thomas (1807-1895), a tailor by trade and an enthusiastic amateur musician who is reported to have been his son's first harp teacher. The harp which he learnt to play was the traditional Welsh triple harp, an instrument with some 99 strings set in three rows and typically placed on the left shoulder, the left hand playing the treble strings, and the right hand playing the bass. In October 1838, at the Cymreigyddion Eisteddfod held at Abergavenny, the twelve-year old John Thomas created a sensation, winning the principal prize of a brand new triple-strung harp. Invited to London, he was heard by Ada, Lady Lovelace, and it was with her patronage that, in 1840, he entered the Royal Academy of Music. Here he was obliged to exchange his triple harp for the standard double-action pedal harp, and obliged to acquire a radically different technique, with the right hand playing the treble strings and the left hand playing the bass. He played the pedal harp for the rest of a career which spanned some sixty years, his last concert taking place on 17 June 1905. Every available photograph of John Thomas shows him seated at one of Erard's elegant 'Gothic' model harps, and indeed, during his lifetime he bought five new London-made Erard harps, the last two in 1890 (no.6680) and 1891 (no.6537). The two Paris-made Erard harps which Edward Witsenburg and Rachel Ann Morgan play on this CD were built respectively in 1897 and 1914, thus ensuring, for a twenty-first century listener, the exciting possibility of hearing John Thomas's compositions recreated with the most authentic sound possible, just as they would have been heard over a century ago. February 1851 saw John Thomas engaged to play for the summer Italian Opera seasons at Her Majesty's Theatre, London. Free to travel during the winter months, the next decade saw him perform all over Europe. Berlioz, who heard him play in Paris in 1854, confessed himself 'charmé, fasciné, magnetisé'. Between 1850 and 1910 he published editions of more than 200 works, including not only his own compositions and arrangements, but works by Spohr, Parish Alvars, Handel and Mozart, whose concerto for flute and harp he published in April 1878, one hundred years after its composition. In 1857, 1862, 1870 and 1874 he consolidated his Welsh links with the publication of his Welsh Melodies for the Harp and his Welsh Melodies for the Voice, and from 1862 onwards he promoted some forty annual concerts of Welsh music with large choral forces and multiple harps. He was invested with the title of Pencerdd Gwalia (Chief Musician of Wales) at the national eisteddfod held at Aberdare in 1861, and ten years later, on the death of his teacher, Frederick Chatterton, he succeded him not only as professor at the Royal Academy of Music, but also, in 1872, as harpist-in-ordinary to the Queen. A further royal appointment as musician-in-ordinary followed in 1885, and after the death of Queen Victoria he ended his distinguished career as harpist to Edward VII. Rachel Ann Morgan and Edward Witsenburg begin their recital with John Thomas's two harp arrangement of the Welsh tune Hela'r 'Sgyfarnog (Hunting the Hare) as presented in his duet 'Come to Battle', composed in 1886. 'Come a-hunting, the hunting horn's sounding/ The sun is rising beyond yonder hill'. Gogerddan (track 2). A harp tune rather than a folksong, it first appeared in print in Edward Jones's 'Relicks of the Welsh Bards' of 1794, but John Thomas's version comes from the third of his four volumes of Welsh Melodies for the Voice, published a century later, and for which he commisioned new words 'in the spirit of the music' from the Welsh poet Ceiriog (1832-1887). As the nineteenth century drew towards its close and the excesses of the romantic movement began to pall, there was a renewed interest in music of the previous century. Handel, in particular was a great favourite with the Victorian public – witness the great Handel festivals held at the Crystal Palace – and John Thomas arranged not only the Harp Concerto (op.6 no.4) for the contemporary Erard pedal harp, but also two movements from the harpsichord suites - the so-called 'Harmonious Blacksmith' from the Suite Vol.1 no.5, and this gigue from the Suite no. 6 in F sharp minor (HWV 431). He arranged the movement for solo harp in 1882, making this two harp arrangement soon afterwards. In order to avoid strain on the mechanism of the instrument, he transposed the Gigue from F sharp minor into the more harp-friendly key of F minor. John Thomas composed for the voice throughout his life. La Primola (track 4) comes from 'Six Songs', a collection of original songs which he published in 1858. The poem is by the Italian poet, Giovanni Torlonia (1831-1858) whose collection 'Poesie' was published in Rome in 1856, two years before his tragically early death, aged 27. Friday evening, 4 July 1862 was the occasion for the first of John Thomas's concerts billed as 'Welsh National Music sung by 400 Voices and accompanied by a Band of Twenty Harps'. It was held at St James's Hall, Piccadilly, but the concert was such a huge success that later the same month it was repeated at the Crystal Palace. The choir sang John Thomas's four part arrangements of Welsh Melodies from the first two volumes of Welsh Melodies for the Voice published on his birthday, St David's Day, March 1st 1862, the fifteen-year-old soprano Edith Wynne made her first London appearance and John Thomas, with his teacher John Balsir Chatterton (1805-1871) performed the duet 'Scenes of Childhood', which opens with the rousing Serch Hudol (Love's fascination) (track 7). The sensational success of these two concerts led to another scheduled for 'St David's evening', 28 February 1863, for which John Thomas composed a second duo for himself and Chatterton, originally entitled 'Scenes of Childhood II', a title soon to be replaced by the awe-inspiringly simple, but memorable, rousing and patriotic alternative, Cambria (track 5), a title which has guaranteed its success and its popularity for almost 150 years. Track 6 features Ymadawiad y Brenin (The Departure of the King), originally a harp tune without words which first appeared in John Parry's 1742 collection, and again in his 'British Harmony' of 1782. John Thomas included it in his third Volume of Welsh Melodies for the Voice (1870), once more commissioning words from Ceiriog. Hob y Deri Dando (track 8) with its nonsense refrain, is one of the few genuine folksongs to be included in the Welsh Melodies for the Voice. A version 'as sung in South Wales' appeared in Volume 1, but this version (track 8) is the North Wales version and was published in Volume 3. The duo Souvenir du Nord (track 9) is dedicated to John Thomas's Welsh-born patron, student and sometime duo partner, Mrs Lucy of Charlecote Park, whom he met in 1853. The following autumn he undertook a continental tour which took him as far as St Petersburg, which is where he heard the tunes used in this duo. One of the first performances of the new work, with John Bilson Binfield playing second harp, was given in Paris at the Salle Henri Herz on 30 March 1854. Dadl Dau (The Quarrelsome Couple)(track 10), an amusing tale of domestic bickering, became a very popular number in John Thomas's concerts, and he included it in the third volume of his Welsh Melodies for the Voice. As usual there were two versions – a solo version, as sung here – and a version for four part choir. The Welsh words are by Talhaiarn (1810-1869) and Ceiriog (1832-1887) and the English by Thomas Oliphant (1799-1873). Ständchen (track 11) and L'Adieu (track 14) come from a volume of fourteen Schubert Songs arranged by John Thomas for harp and piano, composed between 1883 and 1900 and published in a de luxe edition in 1904. Some, like Ave Maria, Marguerite, The Trout and the Barcarole would have been eminently suitable for the Victorian drawing rooms for which they were intended, but others like The Wanderer and the Erl King have passages of fiendish difficulty and are rarely played. In 1863, John Thomas was commissioned to compose his 'dramatic cantata' Llewelyn for the National Eisteddfod held in Swansea that year. The libretto was by John Thomas's friend, the poet-architect John Jones (Talhaiarn), and the cantata was accompanied by an ensemble of six harps. Bedd Gelert (Gelert'sGrave) (track 12) an aria from Act 1, Scene 2 is sung by the maid-servant, Enid, at the request of the heroine, Eleanor de Montfort. Billed as a 'legendary ballad' it recounts the melodramatic saga of Llewelyn, Prince of Wales, and Gelert, his dog, commemorated in the village of Beddgelert. Extracted from the cantata and sung as a solo by Edith Wynne (Eos Cymru- the Welsh Nightingale) it was extremely popular with Victorian audiences. Indeed, such was the success and the reputation of the cantata as a whole that in 1893 it was revived and performed in Chicago as part of the Columbian Exposition World Fair. 'Thou art the star' (track 13) is the last song on the CD, and the only one with an original English text. The poem is by Charles Long, and the song, like La Primola (track 4), comes from the early set of Six Songs which John Thomas published in 1858. Rachel Ann Morgan and Edward Witsenburg bring their recital to an appropriate close with L'Adieu (track 14) played on their two beautifully matched French Louis XVI style Erard harps. John Thomas included his arrangement of this lovely song with the volume of fourteen Schubert Songs he published in 1904, quite unaware that although Victorian England had attributed it to Schubert, the music should, in fact, have been credited to August Heinrich von Weyrauth (1788-1865), with words by Friedrich Gottlieb Wenzel (1779-1819).